Parts of this information kindly provided by Janos Er� and Bruce Rankin. 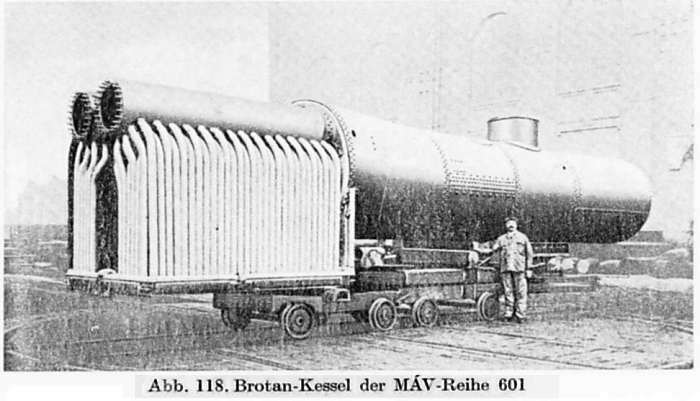 The Brotan water-tube boiler was invented by Johann Brotan, chief of the Gm�nd Workshop of the Austrian StEG (Staatseisenbahn Gesellschaft or State Railway Company). He patented it in 1902. It was widely used in Hungary, but only in small numbers in other countries. The two distinguishing features of the Brotan were its water-tube firebox, and a cylindrical fire-tube boiler which, like The Flaman boiler was full of water and communicated with a cylindrical steam reservoir above it. 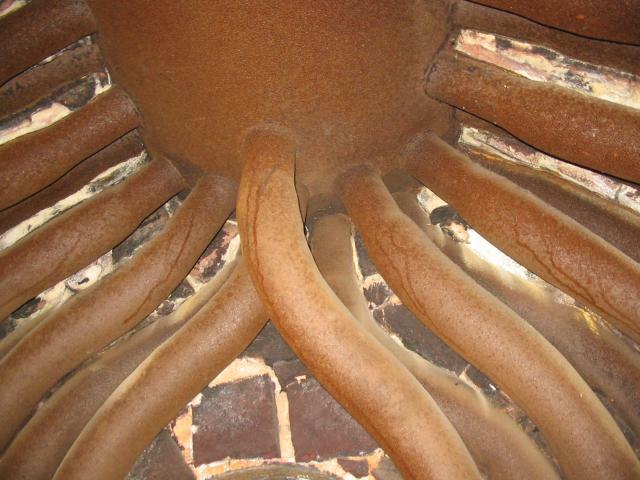 The spaces between the firebox and cylindrical boiler were filled with firebrick. This proved to be a mistake, as have most if not all of the applications of firebrick to locomotives. Before 1914 two Hungarian Class 326 locomotives were rebuilt with original Brotan boilers for evaluation. They were not wholly satisfactory, and were rebuilt with conventional boilers in the 1920's. Many of the Hungarian Brotan-Defner locos survived almost until the end of the steam era, especially the Classes 342, 442 and 328, though most were refitted with conventional boilers in the 1930s and 1950s. 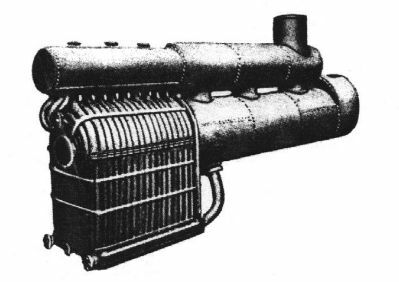 Above: The original Brotan design with a separate steam reservoir above the boiler . The Brotan "garland" was a large bottom pipe joining the vertical tubes. Diagram courtesy Janos Er�. 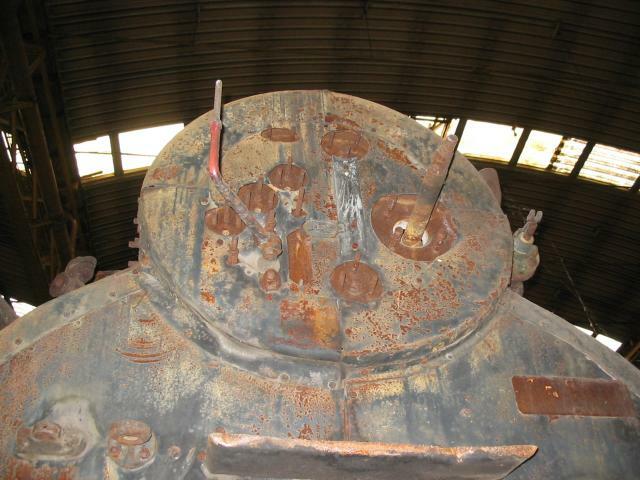 The small knot of pipes at the extreme left connects the watertubes that make up the rear wall of the firebox to the steam drum. Note that there are no over-sized firetubes in the forward boiler section, which implies no superheater was fitted at this period. Left: Rear end of the firebox of a Brotan boiler. Note different arrangement of connecting pipes from rear-wall watertubes to the steam drum. 3 The firebox has 50% more heating surface than the conventional type. 5 More efficient use of the heat in the combustion gases; 20% better. However, the truth is that the original Brotan design was not very satisfactory. Steam production was poor compared with a traditional boiler, the steam was wet, and the lagging required awkward shapes around the upper reservoir. Above: The Brotan-Defner version with its distinctive sloping section in front of the steam dome. Diagram courtesy Janos Er�. The Brotan-Defner boiler solved some of the problems of the original Brotan concept. It was devised by Defner, also from the Austrian State Railway Company. The water-tube boiler was made larger so it was now a combined boiler and steam reservoir; ie just like a conventional locomotive boiler. It was this design that was used in over a thousand Hungarian locomotives. The sloping boiler section is a distinctive identification point. The top header on this version was not just a steam drum- it was partly filled with water, and it was on the rear end of this that the water-gauge (singular) was fitted. The Brotan-Defner design still had a weak point in the fire bricks between the firebox and the boiler, which fractured under vibration. To prevent this, Mih�ly Kubinszky, the M�V chief engineer, designed a steel firebox front wall in the 1920s, and this was applied to a few of the Hungarian locomotives. Left: The firebox of the Brotan-Fialovits boiler, as used on the Hungarian State Railway. 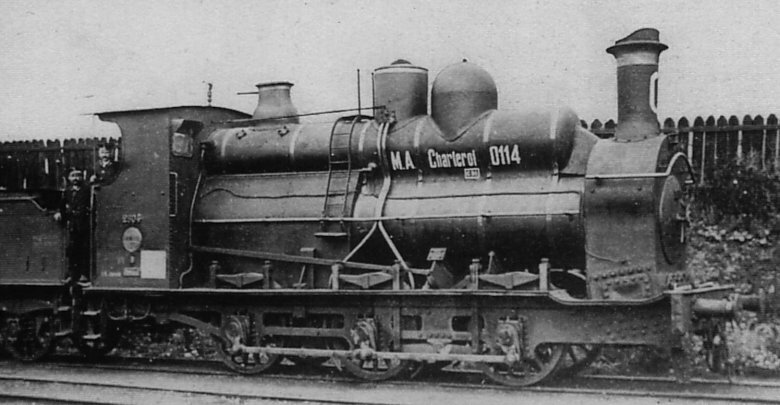 Chapelon in his famous book "La Locomotive A Vapeur" states that the Brotan was "recently improved" (he was writing in 1952) by the Hungarian locomotive engineer Fialovits, who improved the rigidity of the assembly, eliminating movement between the firebox and boiler. This was presumably accomplished by adding the water-wall shown between the firebox and the cylindrical boiler. How this relates to the steel wall introduced earlier by Kubinszky is currently unclear. Left: Longitudinal section of the Brotan-Fialovits boiler. Note the upper firetubes are larger, presumably to hold conventional superheater elements. For much more information on the Brotan and Brotan-Defner boiler, see Brotan Boilers in Hungary by Janos Er�, who has kindly provided some of the information on this boiler system. This is a list (probably incomplete) of countries that used or experimented with the Brotan design. I suspect that some of these may actually refer simply to water-tube boilers rather than the Brotan type specifically, but I could well be wrong. If anyone can offer further information, I would be grateful. A BROTAN BOILER IN FRANCE. 190? 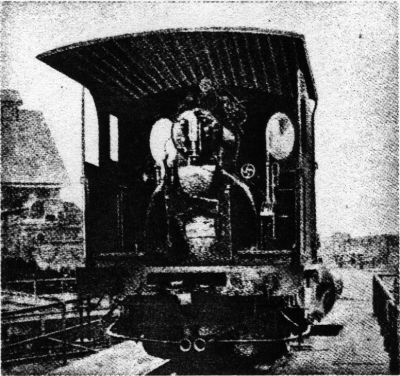 Above: A French Brotan-boilered locomotive. The steam reservoir above the boiler gave a distinctive silhouette. Above: No 2804, originally built at La Meuse in 1900. Converted to a Brotan water-tube boiler in 1908. Photographed Feb 1916, in German hands. 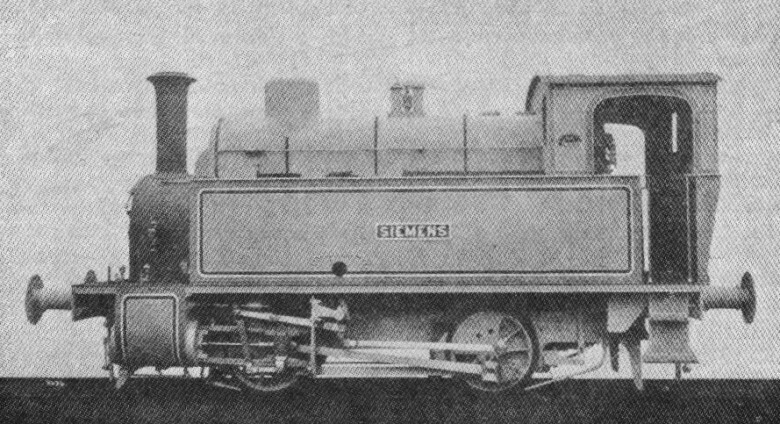 Above: The only British Brotan was an industrial locomotive, built by Beyer,Peacock and Co for the British Mannesman Tube Company. Why it has "Siemens" on the side is therefore a bit of a conundrum. The water drum was 9ft 6.5in long and of 3ft 0.75in diameter. The steam drum was only 2ft 3.75in in diameter but extended back beyond the firebox. There were two openings between the drums. Operating pressure was 180psi. Left: Another view of the British Brotan. Apologies for poor picture quality, but this is a rare beast indeed. A BROTAN BOILER IN AUSTRIA: 1902? Above: A Type 174 Brotan 0-8-0 goods locomotive on the KK StaatsBahnen. (Austrian Imperial Railways) Possibly built in 1902. Left: Austrian 0-6-0 goods Brotan built 1900-1910. Note the pipe coming out of the front of the steam drum. 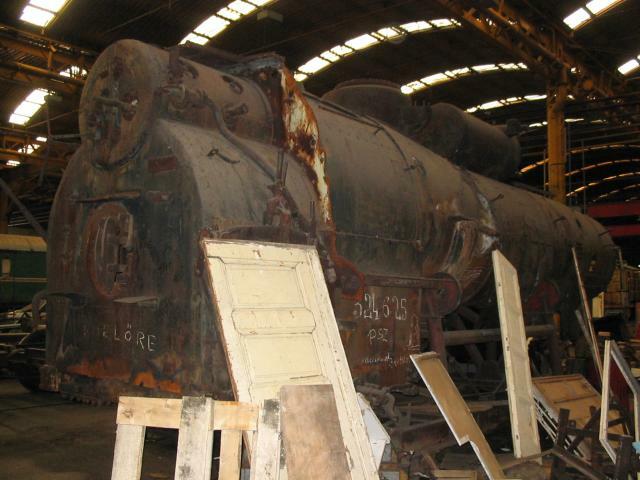 This was probably the steam passage from the regulator to the cylinders, and apparently passed through the smokebox. Left: Austrian 0-6-0 Brotan, as above. Apologies for poor picture quality. Note the single water-gauge on the rear of the top steam drum. This is very strange, because the water gauge is the most important thing in the cab, and its failure could be literally fatal. I am astonished that nobody made the effort to fit in two; I can see no reason why it could not be done. BROTAN BOILERS IN GERMANY: 1940. 1) A weight saving of 3 tonnes. 3) A longer permissible periods between boiler maintenance. Locomotives BR 50 3011 and 50 3012 were also built with Brotans, and it was intended to use them in more 50s and 42s. The snag was that on the Eastern Front maintenance was sporadic and water quality abysmal; in this conditions the Brotan boilers showed a 100% failure rate. No more were built. Hungary was by far the biggest user of Brotan boilers, but information seems to be hard to come by, possibly because of the language barrier. Here is what I have found; if there any errors do please contact me. The big advantage of the Brotan boilers was that they used less copper, as the firebox was constructed from steel tubes rather than copper sheets. This was very attractive for Hungarian locomotive builders, as Hungary had very limited copper reserves. The Hungarian state railway M�V set up an experimental project, and a few locomotives were rebuilt with Brotan boilers in the early 1900's. They were from the locomotive Classes 222, 325, 326 and 377; the most common types. 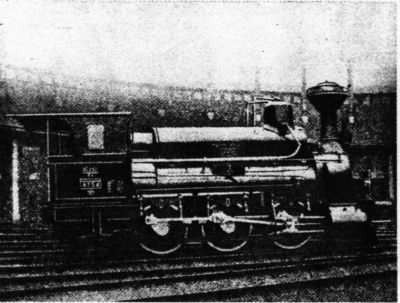 The Class 11 locomotives, a very small design with a 2-2-0 wheel arrangement, was built using Brotan boilers exclusively. Before 1914 two Hungarian Class 326 locomotives were rebuilt using the original Brotan boilers design, for evaluation. They were not wholly satisfactory, and were rebuilt with conventional boilers in the 1920's. All Hungarian steam engines between 1914 and 1921 were built with Brotan-Defner boilers. Those locomotives, originally designed and built before the First World War, were rebuilt with Brotan boilers. These were Classes 324, 375 and 376. All of the new Classes- 601, 342, 328 and 442- were only built with Brotan boilers. 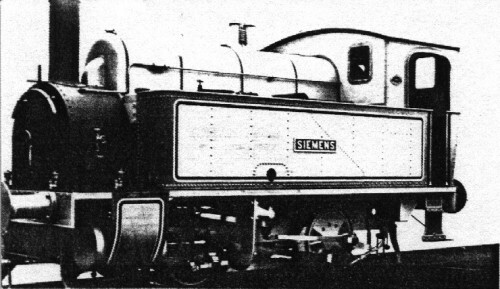 An exception is Class 342, where the two prototypes built in 1913 had copper firebox boilers, but the production version engines were all equipped with Brotan boilers. After WW1 both prototypes were given to neighbouring countries, so only Brotan boilered Class 342s remained in Hungary. For ten years or so the 601 class were the most powerful locomotives in Europe, at 2360 HP, and the boiler was correspondingly large. Eventually their power was exceeded by German locomotives of the 01 and 44 classes. This is the only Brotan boiler with dual steam drums found so far. 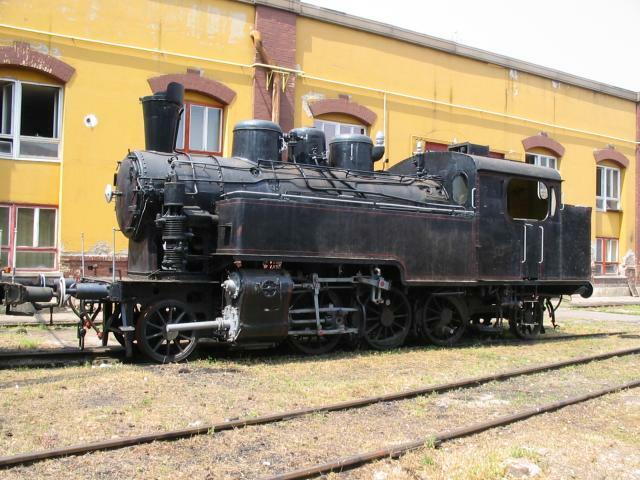 The Class-601 was a Mallet articulated locomotive, with the wheel arrangement 2-6-6-0, built for the Hungarian State Railway (M�V) from 1915 onwards. It was a four cylinder compound, with the low pressure cylinders on the swivelling section at the front. Schmidt superheating was fitted. The 601 Class has its own Wikipedia page. Regrettably no example has been preserved. The Class 651 Mallet locomotives built for M�V all had conventional copper fireboxes, but the private company KsOD ordered similar locomotives in 1913 that were equipped with Brotan boilers. Despite the heavy committment to the technology, Brotan boilered locomotives came to be considered less powerful than their sisters with conventional boilers, and this was proven by trials in the 1920s. Thus after the First World War those Brotan boilered locomotives in of Classes with numerous copper firebox engines, like 324, 375 and 376, were rebuilt with conventional boilers at their major workshop overhauls in the 1930s and 1950s. Even so, a few Brotan boilered members of these Classes survived until the end of the steam era. Those Classes that were exclusively Brotan boilered were not rebuilt; they kept this interesting feature for their whole lifetime. Neighbouring countries were more active, and they usually rebuilt their inherited Brotan boilered engines. M�V sold 20 Class 328 engines to the Czechoslovakian CSD, there they were rebuilt with copper firebox boilers in the late 1920s. Some of these engines remained in Hungary after WW2, and became the only Class 328s with copper fireboxes. The locomotives built in 1914 and 1919 by KsOd received Brotan boilers because of the lack of copper in wartime conditions. The Class 375 had a 2-6-2 layout. They were first built in 1908 to replace obsolete engines use in branch line operation. The class had astonishing longevity, the last steam locomotive built for M�V in Hungary was Class 375 No 1032, constructed in 1958. 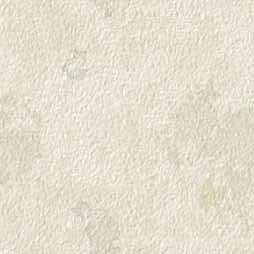 Naturally there were many improvements and design changes during during the fifty years. The Class of locomotive this boiler comes from is not currently known, but 601 is ruled out because there is only one steam drum. Left: Firehole and rear wall of the Brotan boiler. Taken from inside the firebox looking out. Left: Underside of the steam drum of the Brotan boiler. Taken from inside the firebox, looking to the rear. Left: The rear of the steam drum of the Brotan boiler. The fittings have all been removed. This company: www.mavnosztalgia.hu repairs and runs the preserved steam locomotives in Hungary, but none of them are Brotans. Today all the remaining locomotives with Brotan boilers are plinthed and unsteamable. M�V still has the tools to repair the conventional copper firebox boilers of the museum stock, but the Brotan boilers require special tooling, especially for fixing the vertical steel tubes into the upper steam drum and the bottom square tube. The locomotive engineer E Noltein of the Moscow-Kazan Railway was an early advocate of watertube fireboxes and began experiments in the late 1890s. The appearance of the Brotan water tube boiler prompted him to advocate fitting Brotan fireboxes to a number of locomotives as a trial. After some bureaucratic delays, construction of two experimental boilers for 0-8-0 goods locomotives began in 1904. One was fitted to locomotive AH No 447. After two years of trials, Noltein claimed lower repair costs, which met his main aim, and fuel savings of 14.8% were also recorded. However, as usual, the complexities were found to outweigh the theoretical benefits, and AH No 447 was later converted back to a conventional boiler. "The construction of the Brotan water tube boiler is well known. The side walls of the firebox are replaced by large water tubes. The upper end of these tubes are fixed in one or two drums communicating with the barrel. The lower ends are fastened into a hollow foundation ring. This is also connected at the barrel. In this way free circulation of the water in the firebox tubes is assured. The barrel is of the orthodox type, excepting that the firebox tubeplate is circular like the smokebox tubeplate. "The Brotan boiler is well designed and steams freely on account of the water tube firebox; the steam produced, however, is wetter than in an ordinary boiler. The efficiency of the boiler is good and from tests carried out by the Polish State Railways the consumption of fuel in a Brotan boiler is about 5% less than in a boiler of orthodox type. 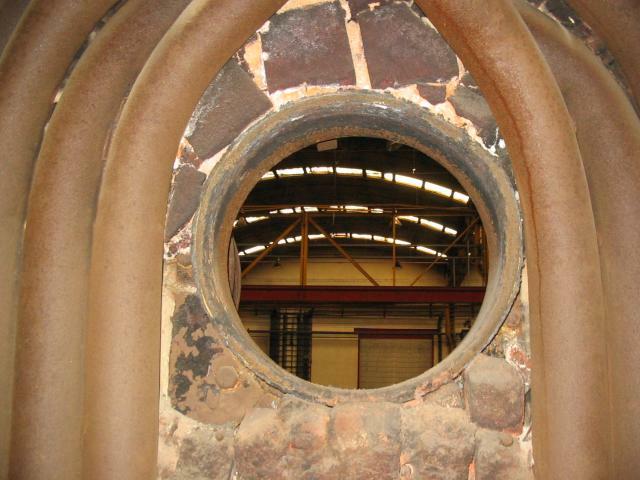 "Compared with the ordinary firebox the junction between the foundation ring and the barrel is less rigid and contains a certain number of parts where the metal is affected by alternating stresses caused by expansion and by vibration, which causes fatigue of the material. The cracks which develop at these places make it necessary to replace the parts in question after a relatively short time. It is also difficult to keep the water tubes permanently tight in the steam drums. d) on the circumference of the steam drum. d) connections between the foundation ring and the barrel. The water tubes of the Brotan boiler require frequent scaling, especially where the feed water is not good, and this requires special scaling tools." These observations are typical of the problems that dogged all attempts to use water-tube boilers in steam locomotives. The assembly of pipes and headers- which worked very well in stationary applications- was simply too vulnerable to the flexure and vibration of a locomotive pounding along a none-too-level track.